Water to be treated is placed in the top container. 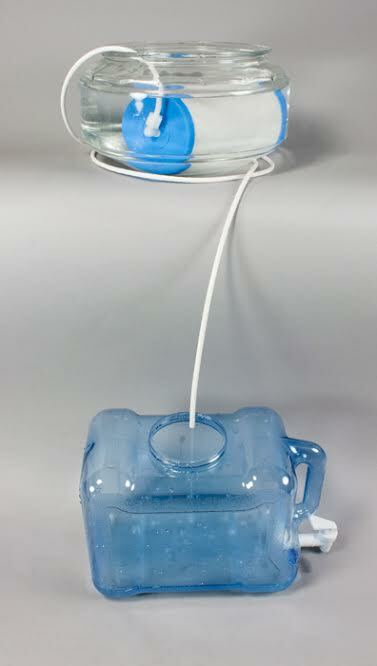 The force of gravity (siphon) pulls the water through the filter into the bottom container. The filter is a high quality coconut shell carbon block that is capable of removing chlorine and a broad range of chemical contaminants from water. 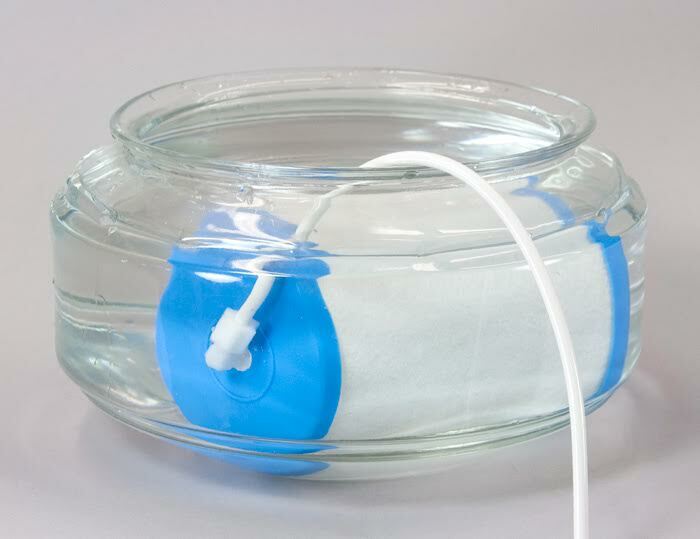 It does not remove bacteria without the help of chlorination. It can be used to make excellent drinking water from any reasonably clean water if chlorine in the form of standard household bleach is added to the water. Suggested uses are during times of emergency when standard water supply is cut off or during “boil water” alerts. Or, it can be used to make excellent drinking water from regular tap water on a regular basis. The source of water during emergencies can be swimming pools, wells, emergency water stored in containers, rivers, lakes, ponds–any fresh water source. The filter will not work with sea water or brackish water. 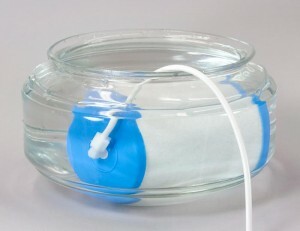 If the water contains visible debris, prefilter the water through a clean cloth or a coffee filter before putting it into the top treatment container. Two drops of regular bleach per quart of water. 8 drops of bleach per gallon of water. 1/2 teaspoon of bleach per five gallons of water. If the water is cloudy, double the dosage. Use regular bleach, not scented. To treat, add bleach to water, stir well, and wait 30 minutes. Water should have a slight bleach odor. If it doesn’t, add a bit more bleach, wait fifteen minutes, and sniff again. The upper container must be large enough to allow the filter to lie on its side. A five gallon bucket will work fine. 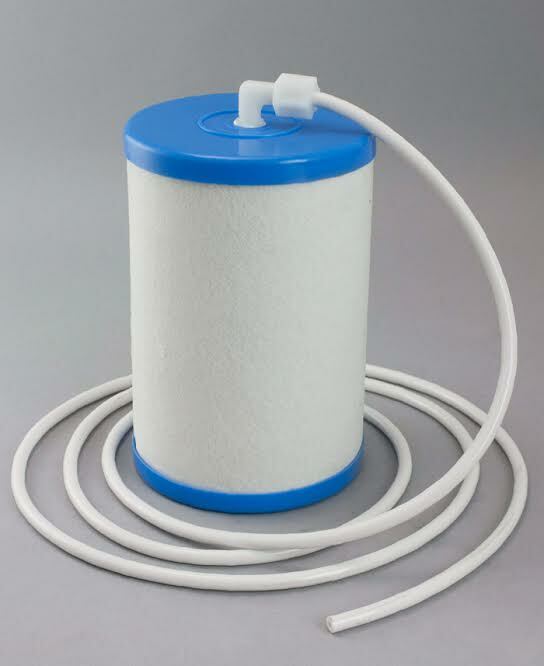 What you need for a complete emergency water treatment kit: The filter itself, which consists of a carbon block filter and a 6′ siphon adapter. A bottle of bleach, an eyedropper, a measuring spoon, a few clean rags for filtering dirty water and/or a few coffee filters. A bottle or bucket to hold the filter (top bottle in the picture): must be large enough to allow the filter to lie on its side. A second bucket or bottle to catch the filtered water. Arrange the filter so that the container with the filter is at least a foot above the receiving container. The higher the elevation of the first filter, the faster the unit will produce. 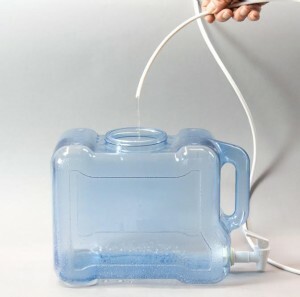 Place the water to be treated in the upper container. Drop in the filter, with the adapter attached. For first use, the fitler will float. Give it a few minutes to sink. When the filter is resting on the bottom of the container, start the siphon by sucking through the tube until you get water in your mouth. It’s just like sucking on a soda straw. When you taste water, immediately lower the tube and the siphon effect will take over and water will continue to be drawn through the filter. The first water out will taste bad because the filter has not been rinsed. Allow the unit to run initially for at least two hours before collecting the water for drinking. This applies only to the first time the filter is used. It will not need extensive rinsing after the first use. The siphon filter will remove chemicals, including the chlorine used to disinfect the water, and make potable, excellent tasting water. Production depends on elevation and water temperature, but you can expect at least 50 gallons per day with even modest elevation. Production rate varies, but the greater the elevation, the faster the production. Keeping the water to be treated as free of visible debris as possible will prolong the life of the filter and keep production rates high. The filter kit itself consists of a high quality coconut shell carbon block filter. The manufacturer suggests a 750 gallon life before replacement, but it will remove chlorine from water for a much longer time. The only assembly required is screwing the adapter hose into the hole in the top of the filter cartridge. The filter will work in a verical or horizontal position, but we recommend laying it on its side. On its side, it will empty the container completely. Call Pure Water Products, 940 382 3814, for performance or product purchase information.